The Western Bluebirds are back again! We never saw these birds the first several years we lived here, but they arrived one Spring 7-8 years ago. We quickly constructed some bluebird nest boxes and they have been returning ever since. These photos were taken April 7, 2010, on or near the bird feeder. It’s been a busy month for copyright news. Just last week we heard that the US Government Accounting Office (GAO) released a report concerning Piracy that pretty much “poo poos” nearly all claims by the media industries concerning what the cost of piracy is. Of course, the RIAA has already lambasted the GAO’s report. Then we have this amazing “Wish List for fighting piracy” from the RIAA & MPAA in their comments to the Intellectual Property Enforcement Coordinator (IPEC). This includes items such as requiring anti-infringement software to be installed on home computers. These folks must be the aliens that 1/5 of people in a recent poll believe exist. Only someone from another world could come up with a list like this! If you’d like to see a more reasonable & balanced input, read what Mike Masnick over at TechDirt submitted last month here. If only we could turn the clock back to 1710, when works were protected for a term of 14 years, extendable only once. That’s actually what our copyright terms were when incorporated within the U.S. Constitution — Article 1, Section 8, Clause 8 — in 1787 & in the first U.S. copyright law in 1790. 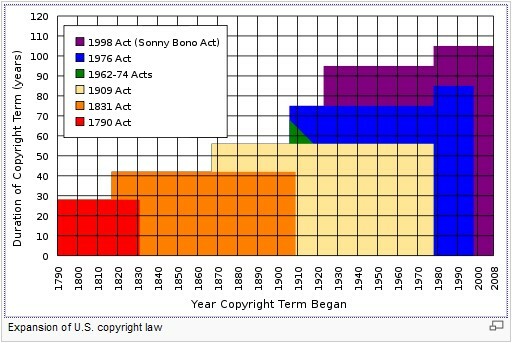 Even Lawrence Lessig (author of numerous books on copyright) has apparently given up on the possibility that any meaningful changes and/or improvements can be made to current U.S. copyright law. The deck is just too stacked against it (i.e., extensive lobbying by media conglomerates; an extremely receptive ear in Congress; copyright-friendly courts; and even the President & his administration). I myself, as many, was mildly optimistic that with the election of a younger, more tech savvy president, that the new administration might see the ludicrousness of current U.S. copyright law. NOT!!! Do you realize that President Obama has appointed five RIAA lawyers so far to the Justice Department? In addition, he has not only openly sided with the RIAA & MPAA, but backs the Anti-Counterfeiting Trade Agreement (ACTA)! Yes… this is indeed a sad time for copyright , certainly not worthy of any birthday celebration whatsoever.